Sorry for not getting any polls out today but I think tomorrow we'll have stuff out from 5 different states which is probably a PPP record for any time not immediately before an election. -Colorado. Even though there's nothing else of national interest on the ballot there next year it's one of the few remaining 2008 'red to blue' states that we haven't polled, which in and of itself makes it worthy of consideration. -Connecticut. The 42 million permutations of Joe Lieberman's political future, what else is there to say? -Rhode Island. Outgoing Governor Don Carcieri is probably the only person who could possibly beat Sheldon Whitehouse next year so interested just to see if there's a possibility of that or not...we're releasing numbers looking at a similar scenario in Wyoming tomorrow. -Texas. Interested in seeing how much risk Kay Bailey Hutchison is at of getting Tea Partied, and whether Democrats would have any shot in the general election if she was. Also interested in seeing if a Sarah Palin nomination would give Obama any chance at winning the state because after last year that's about the only way I see it being competitive. -West Virginia. We tested Shelley Moore Capito against Joe Manchin on our final poll before the election last year and found her doing only one point better than John Raese was on the same poll- so I really don't know how formidable of an opponent she is at this point but no harm in looking at it again now he's taken his seat in the Senate and we can also poll on the Gubernatorial race in the state. Voting is open until Thursday. I didn't put Arizona on the list because I feel a little awkward about polling there this week but I'm open to question suggestions related to Saturday's tragedy for our national poll- as well as anything else you think we should ask. It would be curious to see what people's perceptions about the overall "tone of political rhetoric" are. Responses in line of "Too heated, moderately heated, just right, or not heated enough" would be interesting to see, along with cross tabs to see how different folks are feeling about the political environment. Colorado because -- http://frontloading.blogspot.com/2011/01/view-of-2008-presidential-election.html -- of its position. Due to my curiosity, I was wondering why PPP does not conduct polling in North Dakota or Indiana? 5:06, I guess we don't need to do any more Obama/Palin national polls since one already found her down by 22 points? 6:35, it has to do with restrictions on automated polling in both states. Yeah. Much too soon to be doing polling in Arizona. Good call. That leaves Connecticut atop my list. Maybe test Lieberman-as-D against McMahon or Simmons, test Lieberman-as-R against some of the Democratic options, test a couple R-D-Lieberman scenarios, and some straight-up R-D scenarios with Lieberman out of the picture. I have the feeling McMahon or Simmons might beat Lieberman in a straight-up contest, but any others seem likely to be comfortable D wins. Texas could be interesting too, particularly mixed with some questions about the state budget deficit, which has turned out to have the >$22 billion deficit Bill White identified, rather than the $11 billion deficit Perry pointed to (and there literally is not enough room in the Texas state budget to reduce that hole without major cuts in health and education; the only other option would be a constitutional amendment to allow them to use highway funds for other purposes). Tom, are you doing only one state poll alongside the national poll? Good call on AZ. But when are you doing your national poll? I wanted to see the results from a Palin/Obama race. Also, you should do Texas to see if The Tea Party is strong there. "Tom, are you doing only one state poll alongside the national poll?" Yes, like usual in weeks we do a national poll. There is no reason to poll Texas. I would poll Georgia before Texas. Colorado will actually be a snoozer in 2012. Obama's win was pretty flukey, and the general conservatism of the state combined with his miserable favorables there would tell me that the race will be won in OH, NC, VA, and NV. Not Colorado. I know that the Democrats did win the Senate contest there in November, but Bennet found a way to move far enough to the middle to make himself look more moderate than Ken Buck. The race was completely localized, but that won't be the case in 2012. In Coloraod it's GOP +8 in 2012. Obama wins everything else. Anon, there was nothing flukey about the Dems' success in CO in 2010 in a severely GOP electorate. It continued the blue trends of the previous three cycles (2004, 2006, and 2008). We'll see when we eventually poll it, but I'd imagine Obama leads all four Republicans there right now. 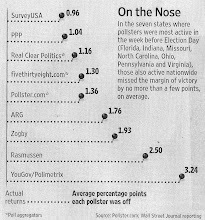 Romney probably runs closest. West Virginia: Really curious if Carte Goodwin would be better then Joe Manchin in 2012. Also in the race for governor, Betty Ireland, Mike Stuart, Clark Barnes and Mark Sorsaia for the Republicans and Earl Ray Tomblin, Rick Thompson, Natalie Tennant, John Perdue, Jeff Kessler and Brooks McCabe for the Democrats. In Texas, candidates are Andrew Castanuela, Elizabeth Ames Jones, Michael Williams and Roger Williams [Potentials]: Susan Combs, David Dewhurst, Kay Bailey Hutchison, Tom Leppert and Florence Shapiro. For Democrats, Chet Edwards and John Sharp? Rhode Island: Names mentioned as opponents to Sen. Whitehouse are T. Joseph Almond, Scott Avedisian, Donald Carcieri, Giovanni Cicione, Leo Fontaine, Allan Fung and John Robitaille. National question: should the sanitized version of Huckleberry Finn be taught in schools rather than the version with the n word? Or does that paper over a divide with which schools should deal? Particularly interested in the opinions of African-American people. It is rare to see not Maine in the list. If I'm not wrong you poll not Maine after the elections, true? I hope we can see fast polls about Nebraska, West Virginia and Connecticut (and Maine, of course).